House of the Dead: Overkill has had 32,998 players report play-time data on the Nintendo Channel, since the game released in February. The Conduit was released in June, and has had 48,488 players report play-time data on the Nintendo Channel. 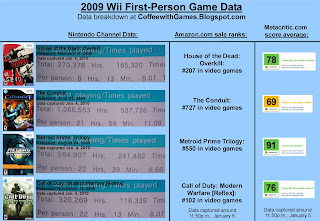 Metroid Prime: Trilogy has had 24,946 players report their data, since the game released in August. Call of Duty: Modern Warfare [Reflex] was released just in November and has 14,416 players report data on the Nintendo Channel. House of the Dead: Overkill had 270,378 Total Hours reported, an increase of exactly 9,500 hours from last week. The Conduit had 1,066,553 Total Hours reported, an increase of 30,721 hours from last week. Metroid Prime: Trilogy had 564,907 Total Hours reported, an increase of 41,093 hours from last week. Call of Duty: Modern Warfare [Reflex] had 320,269 Total Hours reported, an increase of 82,654 hours from last week. House of the Dead: Overkill's Amazon.com sale rank is #207, and is selling for $19.96. The Conduit's sale ranked is #727, and is selling for $27.99. Metroid Prime: Trilogy is ranked #550, and is selling for $43.99 from Amazon.com 2nd Party/3rd Party Sellers, because Amazon.com doesn't have Metroid Prime: Trilogy in stock. Call of Duty: Modern Warfare [Reflex] is ranked #102, with a selling price of $46.99. House of the Dead: Overkill had 1,407 more players reporting data this week, than last week. The Conduit had 2,111 more players reporting data this week. Metroid Prime: Trilogy had 2,929 more players reporting data this week. Call of Duty: Modern Warfare [Reflex] gained 4,864 more players reporting data in the last week. Metroid Prime: Trilogy, for some reason, still isn't in stock on Amazon.com, and it's still only available from 2nd or 3rd party vendors. I'm emailing Nintendo again about this, and if I get a reply, I'll post an update. I just find it strange that Amazon.com hasn't had Metroid Prime: Trilogy in stock in a long while, yet Target had it in stock tonight when I was in the store. Same as last week, for those that may have missed it, did anybody receive any of these games for Christmas(or other holidays you may celebrate)? If so, what do you think of what you've played so far? If you didn't get any of these games, are you planning on getting any of them soon? I should be picking up a video/picture capturing device tomorrow, so hopefully the pictures next week should improve as long as the device works properly. Also, I should be renting one of these games tomorrow, and that game will be Call of Duty: Modern Warfare [Reflex]. If you're playing it online currently, I'll post my friend code after I get the game and maybe I can get a few matches in with some of you! Updated Notes! I acquired my video/picture capturing device today(1/6/10), and I attempted to rent COD:MWR, but the store couldn't find the game disc. I did sign up and rented another game, and I'm going to attempt to record some footage late tonight or tomorrow and see how it all works out. Nintendo Channel data captured after the Nintendo Channel updated on Monday, January 4, 2010. Numbers of players reporting data are rounded down to the nearest whole number. I am glad to see CoD:MWR continue to increase in players. I hope this will be a game that has a long tail. Thanks again for a comment! I really wish that 3rd Party developers other than High-Voltage Softare and Treyarch, took notice that Wii owners like and play FPS games. If you didn't notice my "update", I acquired my video/picture capturing device today, but when I attempted to rent COD:MWR, the store couldn't find the game disc. I did sign up and rented another game though, and I'm going to attempt to record some footage late tonight or tomorrow and see how it all works out. That's awesome about the video/pic capturing device. That is a shame that the store couldn't find the disk. Hopefully you can get it at some point in time. I will keep an eye out for your post. BTW where did you get your capturing device I have been trying to find one but am not having much luck. I'm posting a comment on your blog post, about Rune Factory, on where I got the capturing device. As I mentioned on some posts that I've no problem getting this games. But thanks for your capturing device. I've been keep looking for your future posts.